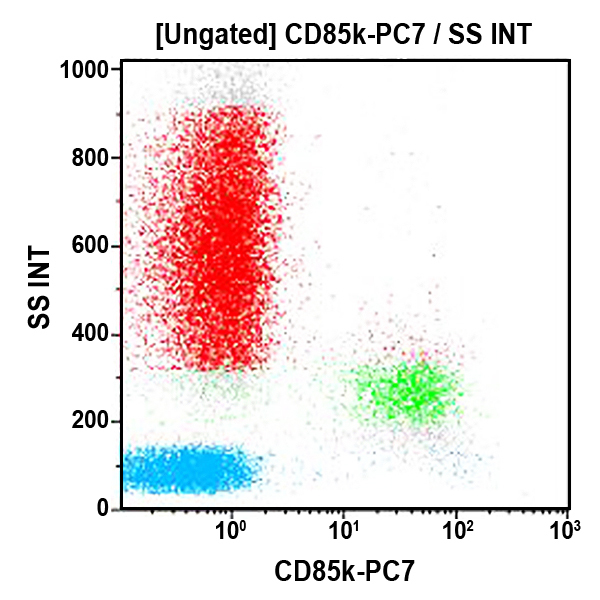 The CD85k antigen (ILT3) is a member of Immunoglobulin (Ig)-Like Transcripts (ILT), also known as Leucocyte Ig-like Receptors (LIR) and Monocyte / Macrophage Ig-like Receptors (MIR). ILT are expressed on monocytes, macrophages, dendritic cells (DCs) and granulocytes, except ILT2, which is expressed by both myeloid and lymphoid cells: NK, T cell subsets and all peripheral B cells. All ILT receptors except (ILT6) are transmembrane proteins and have been classified in 3 types: Inhibitory: ILT2, 3, 4, 5, LIR8; Activating: ILT1, LIR6a, 7, LIR8, with a cytoplasmic tail associated to FcRγ; Soluble: ILT6. The CD85k antigen (otherwise known as LIR-5, HM18) is a transmembrane protein of 60 kDa, constitutively phosphorylated. Unlike ILT2 and ILT4, ILT3 does not bind to HLA-A, -B and -G1 molecules. The ligand of ILT3 is unknown, however research studies point out the following functional properties: ILT3 is involved in antigen uptake and presentation; ILT3 negatively regulates Antigen Presenting Cell (APC) functional responses triggered via stimulatory receptors such as CD11b, CD16, MHC-class II. The transmission of a negative signal via ITIMs may be one of the inhibitory mechanisms, ranging from temporary to permanent inactivation, that control homeostasis, and immunological tolerance. It has been shown that ILT3, unregulated on monocytes and DCs by CD8+CD28- T suppressor cells, renders these APC tolerogenic. Clone Description The ZM3.8 antibody immunoprecipitates a protein of 55 kDa from ILT3-transfected T cells and a protein of 60 kDa from monocytes.